To Move a Mountain is an inspirational account of how a group of Appalachian men and women, politicized by the disaster of local plant closings, became unlikely activists in the Tennessee statehouse and the protests in Seattle. 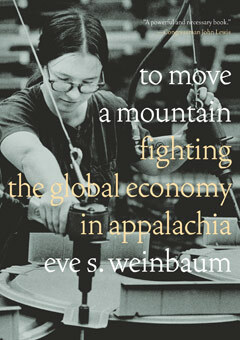 Eve Weinbaum’s firsthand look at the devastation wrought by the closings of community-sustaining factories become moving stories in the age of corporate globalization. With striking portraits of managers, workers, organizers and local officials, the book sets the Appalachian plant closings squarely in the economic and political context of economic development strategies and uncovers a government and economic leadership whose policies show little regard for the workers they leave behind. Yet the repeated defeat of the workers sparked an astonishingly fiery economic justice movement in Tennessee, as factory workers were transformed into sophisticated activists, generating coalitions, starting allied campaigns for living wages, and writing groundbreaking legislation. With careful consideration of what made some movements flourish and others die, To Move a Mountain is at once a detailed and intricate ethnography and an inspiring story on the evolution of seemingly insignificant local organizing efforts into sustained social movements.